Parsnips look like white carrots, but taste like magic. They are peppery, slightly floral, and just a tiny bit sweet. I love them pureed or in soups, but simply roasted is one of the easiest and best ways to prepare them. And if you want to take them up a notch even further? Toss them with some freshly made chimichurri sauce! If you've spent any time on this blog, you've probably already encountered chimichurri sauce. My love for this garlicky herb sauce runs deep. I've used it as a quick pasta sauce, a fish taco-topping, and a marinade. It's even great with roast chicken! Blitz up a quick batch of it (it takes seconds--everything into a blender!) and then use it all week long to make your meals taste amazing. Toss parsnips with olive oil and arrange on a baking sheet making sure not to crowd pan (use 2 pans if needed). Season generously with salt and black pepper. Roast 15 minutes, toss once, then roast an additional 10 minutes. While the parsnips roast, make the sauce. In a food processor, combine all the sauce ingredients except the oil, and pulse just until everything is coarsely ground. Place in a bowl and add oil, stirring to combine well. Taste and add more salt and/or pepper as needed. 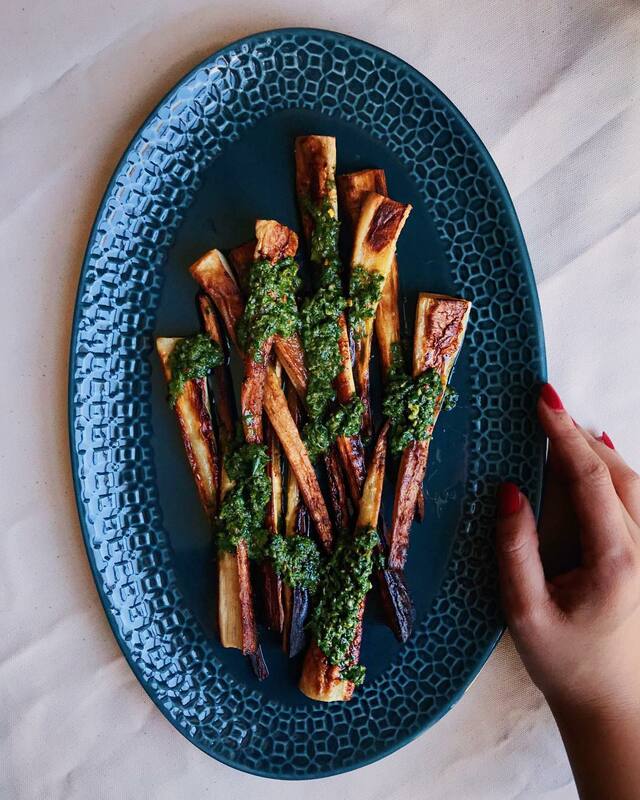 Serve parsnips with chimichurri sauce.